For all the Canadians in the crowd — Happy Thanksgiving!!!! We were so thankful to be able to celebrate with family and friends last night. And our wonderful host, Michael, was sweet enough to accommodate all of our food challenges: one gluten-free vegetarian-blogging-vegan-for-the-month (me! ), one vegetarian, two omnivore mushroom-haters, and two omnivores who will eat anything. I got charged with making dessert. 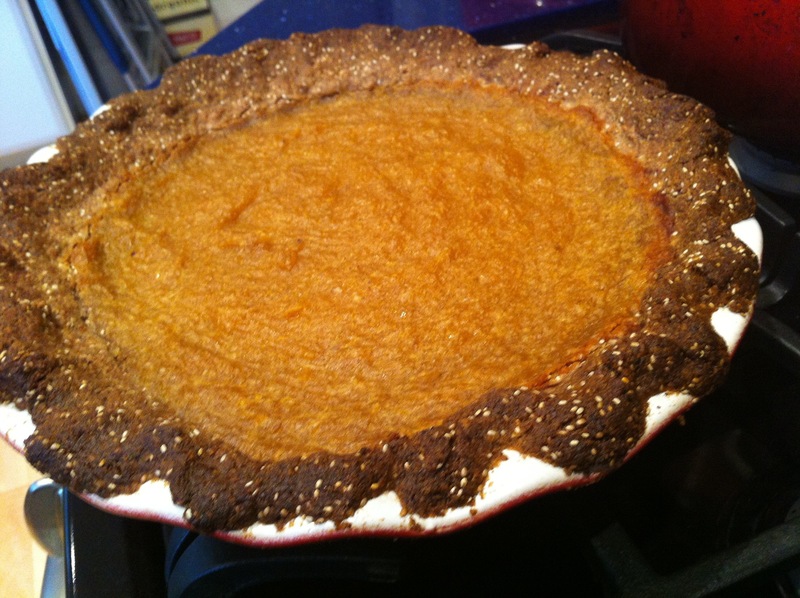 I figured I’d bake for myself and make a gluten-free and vegan pumpkin pie — and then the other folks could enjoy it too. I found a recipe from Oh She Glows and set forth to experiment on my lovely friends (and sister!). 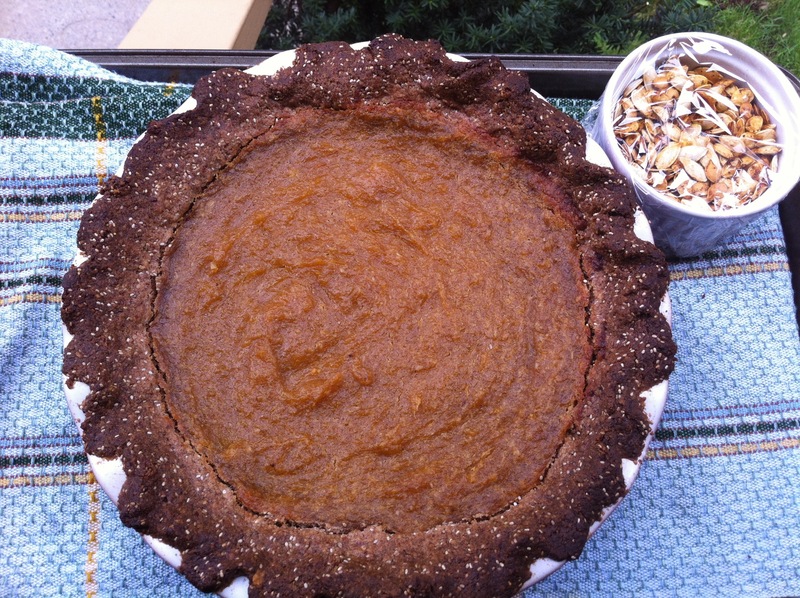 And I can tell you — this pie got extremely rave reviews!!! 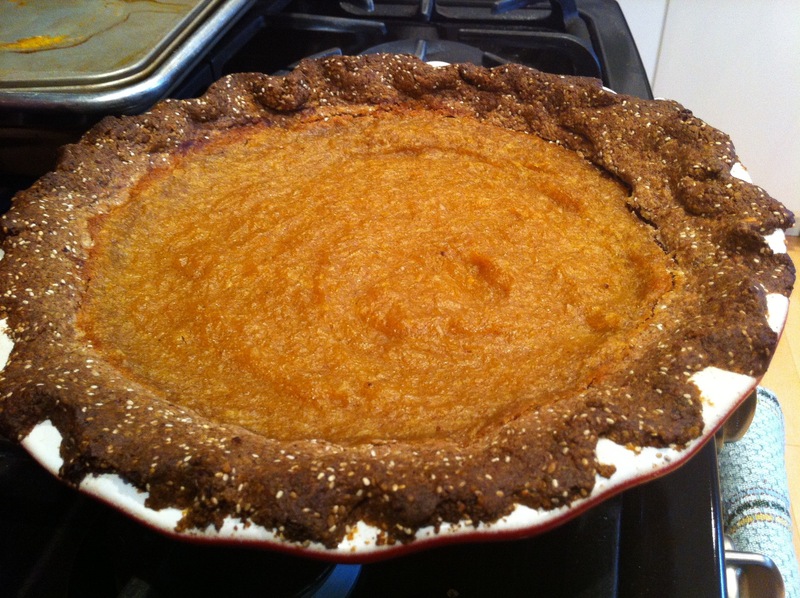 I really adored the crust, and will definitely be using it again for other pie fillings too. This was my first time making pumpkin pie filling totally from scratch. In the past, I’ve used a tin of pumpkin puree — but you know what? This was just as easy and even more delicious. If you can roast a squash, it’s a no-brainer to get even more pumpkiny flavour. 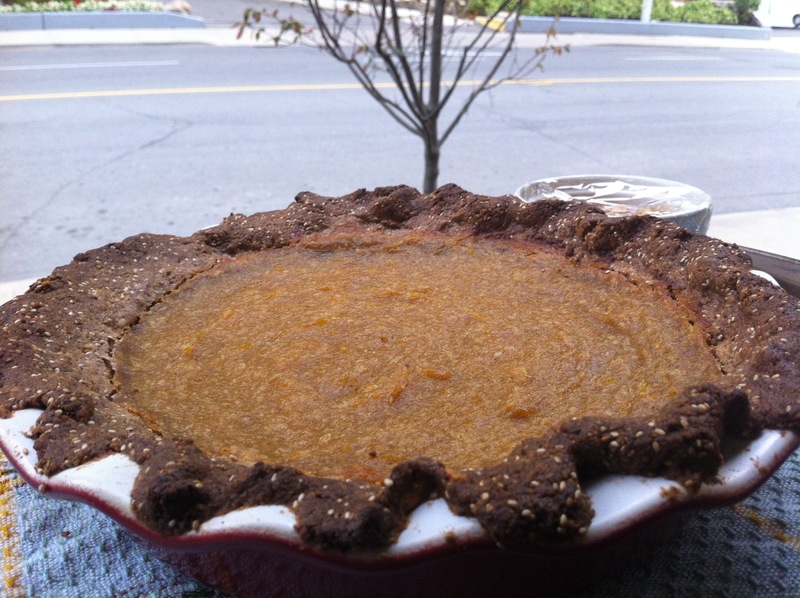 And you get to say you started from a pumpkin, and ended with pie. Cut the pumpkin in half, and scoop out the seeds. Place each half on a baking sheet, cut side down. Roast at 30 minutes, or until the flesh of the pumpkin is fork-tender. Remove from oven and set aside to cool. Preheat oven to 350F. Grease the pie dish well with coconut oil. In a food processor, blitz the pecans until the nuts release their oils and the mixture starts to clump together (be careful that you don’t make pecan butter). Transfer the pecans to a mixing bowl, and add almond flour, sugar, chia seeds, cinnamon, salt, maple syrup, and coconut oil. Stir until the ingredients form a ball. Prebake the crust at 350F for 12 minutes. 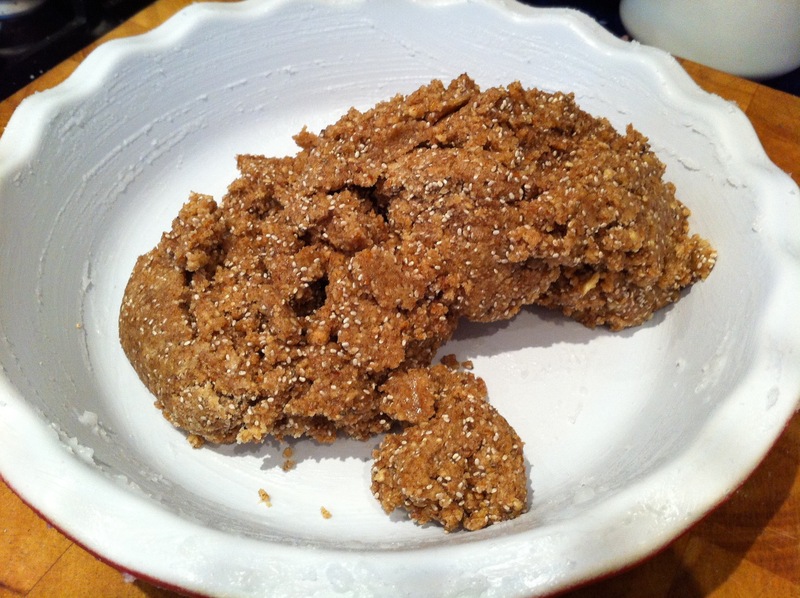 In a large bowl, whisk the maple syrup and arrowroot powder together. Add the sugar, coconut, vanilla, cinnamon, ginger, nutmeg, and clove, and whisk well to combine. 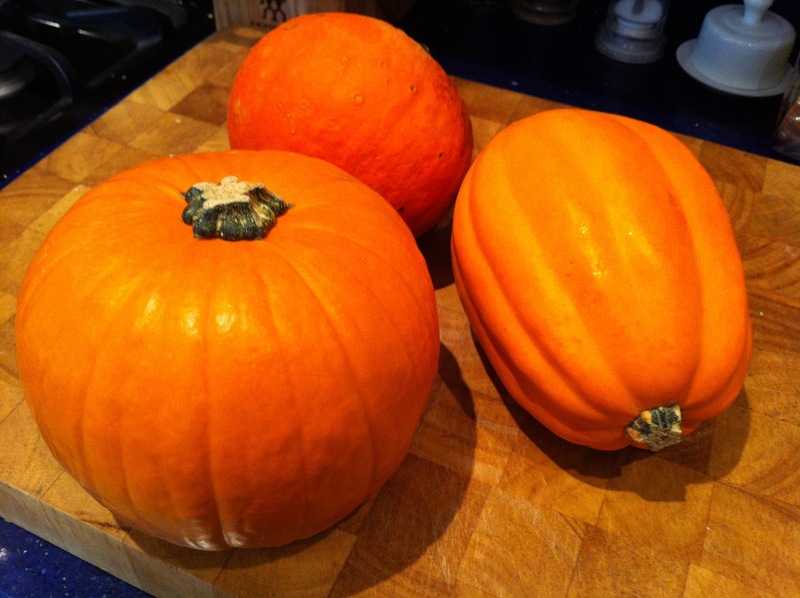 In a separate bowl, remove the roasted pumpkin flesh from the skin, and discard the skin. Mash the flesh well, then add to the maple syrup and spice mixture. Mix all ingredients together until well-incorporated. 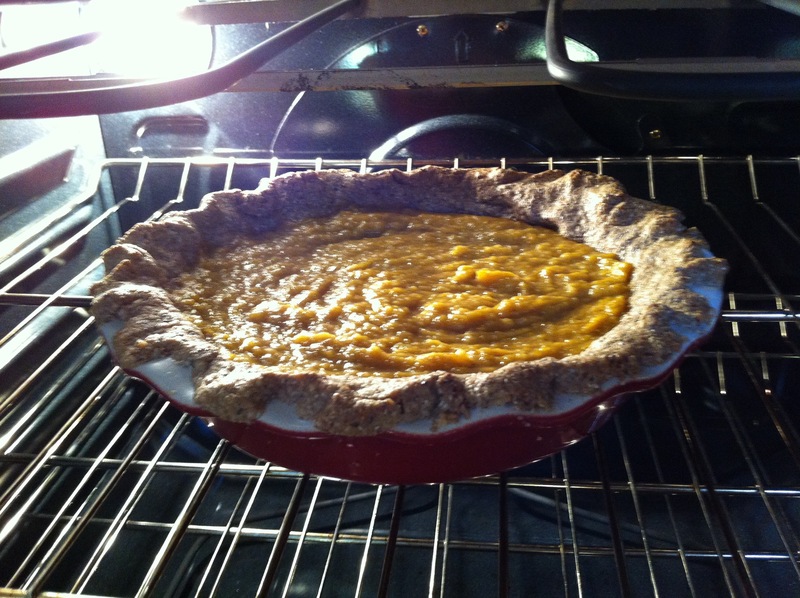 Pour the filling into the crust, and smooth down the top with a spatula or spoon. 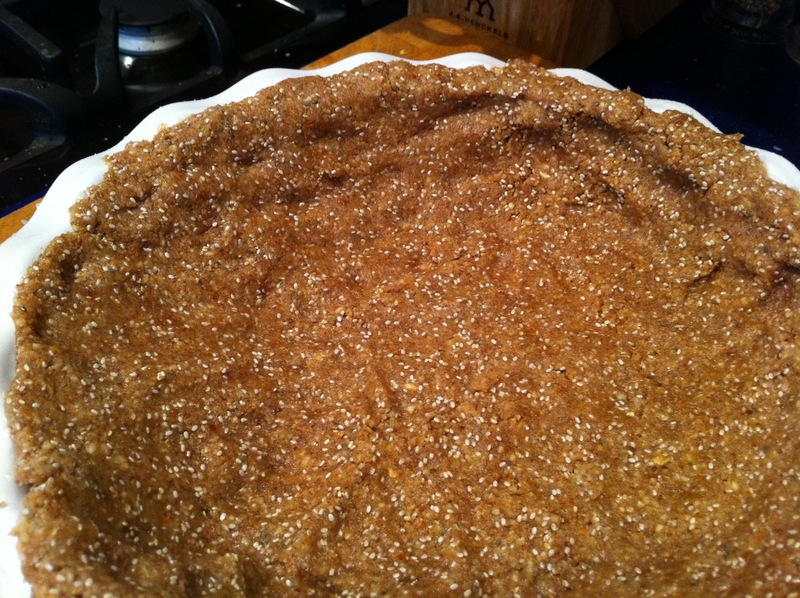 Cover the edges of the crust with a crust shield or tin foil. Bake at 350F for 50 minutes. Cool on a wire cooling rack for 1 hour, then transfer to the fridge and let set for 3 hours (or overnight). that crust looks amazing!! i love that you fluted the edges 😉 i remember seeing thev oh she glows recipe when she posted and loved the ingredients. i’m glad everyone enjoyed it so much!! 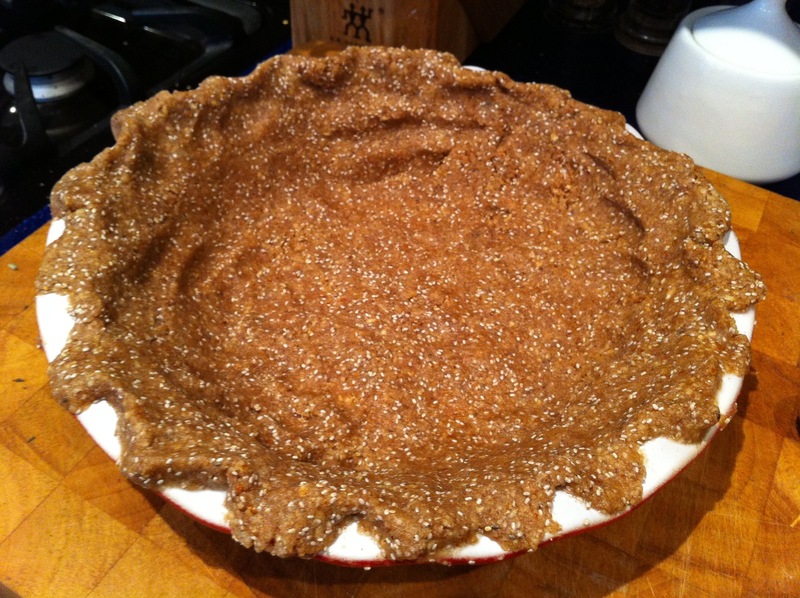 A pecan almond crust sounds so decadent and lovely! Mmm! Yum, I love nuts as bases for crusts! Looks like a delicious Thanksgiving. This was so delicious!!!! Best pie EVER!!!!!!!!! Your post reminds me of my mom’s pumpkin pie. I remember the first year she used fresh pumpkins instead of canned. Totally backed herself into a corner on that one. You just can’t go back to tins once you’ve used fresh pumpkin. Your recipe is a great non-dairy version I’ll have to add to my list for xmas. I hope you enjoy it!!! You’re right — I’m now hooked on real pumpkin!! We also had a blast!!! Oh, and yes, the wine was special! I think it was the company that really made the evening.